К гонкам 1927 года, проводившимся в Венеции, были готовы новые гидросамолеты-монопланы S.5. Один оснащался 900-сильным (671 кВт) ПД Napier Lion VIIA, а другой - 875-сильным (652 кВт) Napier Lion VIIB. Полумонококовый фюзеляж был выполнен ДальшеMore>>> преимущественно из дюраля, а низкорасположенное крыло имело деревянные лонжероны и нервюры с обшивкой из фанеры. В этих состязаниях самолеты S.5 заняли первое и второе места. На предпоследних гонках в британском Калшоте в 1929 году "Supermarine" представила два доработанных самолета S.6, оснащенных 1900-сильными (1417 кВт) ПД Rolls-Royce "R". Один из них, пилотируемый офицером британских ВВС Р. Уэгхорном, пришел первым, показав рекордную скорость 528,87 км/ч. Из-за отсутствия государственной поддержки проведение гонок 1931 года в Британии стояло под вопросом. Однако они состоялись благодаря кампании сбора пожертвований, развернутой леди Люси Хьюстон. У компании "Supermarine" не было возможностей подготовить новый самолет, поэтому доработкам подвергли S.6, оснастив его 2350-сильным (1752 кВт) вариантом двигателя Rolls-Royce "R". Названный S.6B, самолет, пилотируемый флайт-лейтенантом Дж.Н. Бутманом, продемонстрировал в Калшоте рекордную скорость 547,31 км/ч. Завоеванный в третий раз кубок Шнейдера навсегда остался в Британии. В тот же день, 13 сентября 1931 года, флайт-лейтенант Джордж Стэйнфорд, использовав резервный S.6B, установил новый абсолютный мировой рекорд скорости - 610,02 км/ч. Благодаря усилиям "Supermarine" и "Rolls-Royce", конструктора Реджинальда Митчела и специалиста по топливу Френсиса Бэнкса, Великобритания добилась значительного успеха. Эта же слаженная команда сыграла важную роль в развитии британской авиации и в конце 1930-х годов. 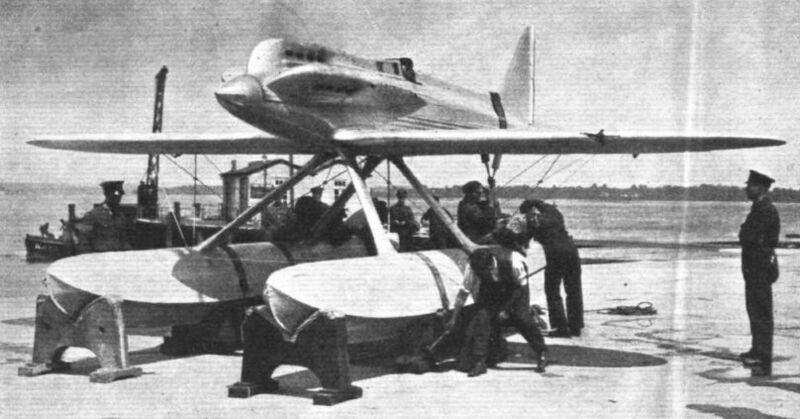 The Schneider Trophy challenger produced by the Supermarine Aviation Works, Ltd., of Southampton - the Supermarine-Napier "S.5" - undoubtedly looks as if it meant to win back the Trophy, as may be gathered from the accompanying illustrations. But what is more important, tests have demonstrated that we have something more than looks to count upon. Mr. R. J. Mitchell, Chief Engineer to the Supermarine firm is responsible for the design of the "S.5" (we understand three of these machines have been constructed), whilst thanks are also due to the very valuable research work and co-operation of the Technical Officers of the Air Ministry, the Royal Aircraft Establishment at Farnborough, and the National Physical Laboratory at Teddington, that have been rendered in connection with its design and construction. 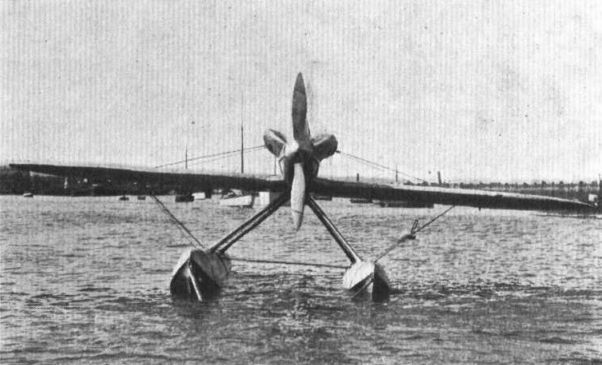 The "S.5" is a low-wing twin-float mono-seaplane developed from the "S.4" - to which it is very similar in general appearance - which took part in the 1925 contest and also won the world's speed record for seaplanes; incidentally, the "S.4" still holds the British speed record for both land and seaplanes. 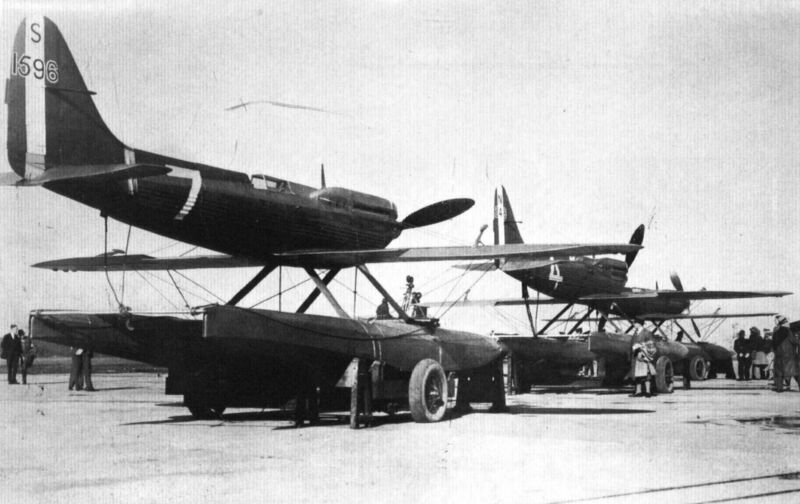 It may be of interest to note in passing that these machines were the first mono-seaplanes (float) to be used in the Schneider contests since the early days - the Italian Macchi being produced after the "S.4" made its debut. As we mentioned before we are unable to describe the "S.5" in detail, and can only refer to it in a general sort of way. It has, however, a number of very novel features which we give herewith, and these, together with our illustrations should provide our readers with some idea, at any rate, of its characteristics. All the fuel is carried in the starboard float, the fuel tank being constructed as a section of the float. The effect of this is partially to balance the engine torque and thereby improve the flying qualities of the machine. The fuel is carried up to the engine by means of an engine-driven pump. The wing surface radiators are an entirely new development and are a definite advance on anything previously used. They cool the engine without adding any resistance whatsoever to the machine, having a perfectly flat outer surface. The wing is built of wood and is covered with special laminated wood underneath the radiators. The fin, to which is hinged the rudder, is built integral with the fuselage, and the tail plane is also neatly faired into the latter. The fuselage is constructed entirely in metal, the skin taking practically all the stresses. The engine mounting consists of a cantilevered extension to the fuselage, the skin of the mounting taking all engine loads. It may be noted that the fuselage is probably smaller in cross sectional area than any fuselage previously designed, and the pilots have had to be specially "fitted" to the machine. The area of maximum section is only just over half that of the "S.4." In order to clear the cockpit of exhaust fumes and hot air during flight, it has been found necessary to fit fresh-air ducts. Oil cooling is effected by passing the oil along both sides of the fuselage in contact with the skin through specially-constructed oil coolers. As regards the floats, these are comparatively long and are constructed of Duralumin, being anodically treated to resist sea-water corrosion. They are connected to the fuselage by two pairs of V struts. Of the engine, the special racing Napier "Lion," particulars are given elsewhere, so we need only add here that the airscrews for the "S-5" have been designed and manufactured by the Fairey Aviation Co., of Hayes. The Supermarine Aviation Works, Ltd., will be represented in Italy, by Commander James Bird, Chairman and Managing director, Mr. R. J. Mitchell, Director and Chief Engineer, and the Supermarine crew will consist of Mr. A. Powell, Mr. B. Pickett, Mr. G. Broome, Mr. B. Tozer, Mr. G. Pearson, Mr. H. Grimes, and Mr. B. 15. Brown. It is anticipated that the machines will leave England in two consignments, one on or about August 16, and the other on or about August 26. As a result of the purchase, some months ago, of the Supermarine Aviation Works by Vickers (Aviation), Ltd., the two firms are now practically one, with Supermarine's looking after the maritime side and Vickers after the aeroplane side. This division is probably not intended to be an absolutely rigid and unalterable one, but with the accumulated experience of 15 or 16 years of specialising on marine aircraft, it may be assumed that in the great majority of cases the Southampton designing office will deal with marine types. It is logical that, on the other hand, Vickers (Aviation), Ltd., should devote their energies to aeroplanes of all types and classes, their experience of which dates back to the early days of flying in Great Britain. The two firms thus united are both among the pioneer aircraft companies of Great Britain, and the combination should be a very powerful one. At Olympia the two firms will naturally exhibit their aircraft together, but for the sake of easy reference we have thought it preferable to deal with the exhibits separately. 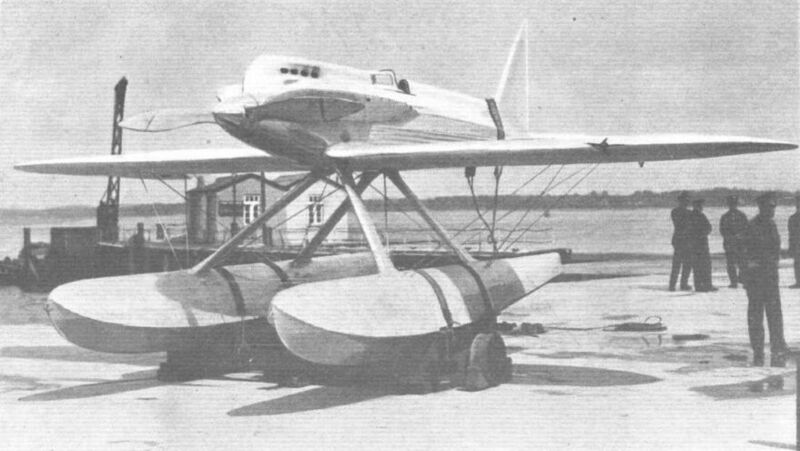 Supermarine's will, it is hoped, exhibit two complete marine aircraft: One of the metal "Southampton" flying-boats with Napier "Lion" engines which made the 27,000 miles' R.A.F. Far East Flight, and the other the Supermarine S.5 with Napier racing engine which won the Schneider Trophy for Great Britain in 1927, and which, in 1928, gained the British high-speed record of 319-57 m.p.h. . 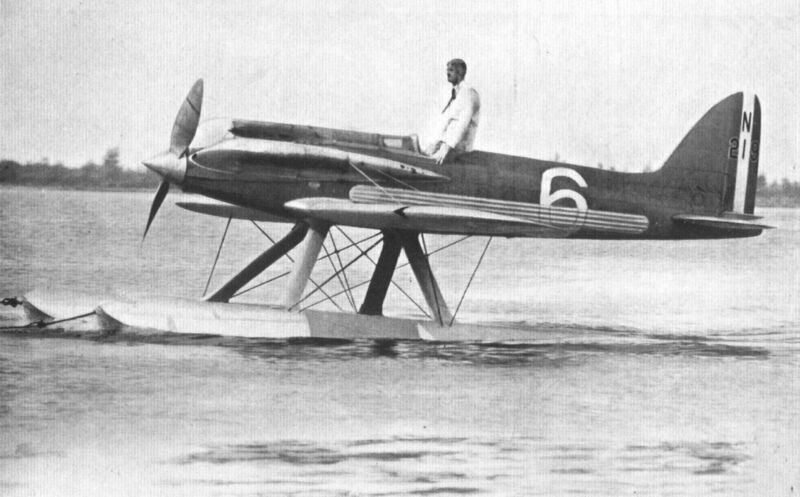 The Supermarine-Napier "S.5" racing seaplane is, as already mentioned, the type which won the Schneider Contest in 1927. Two of these machines are being used by the high-speed flight of the Marine Aircraft Experimental Establishment of the R.A.F. 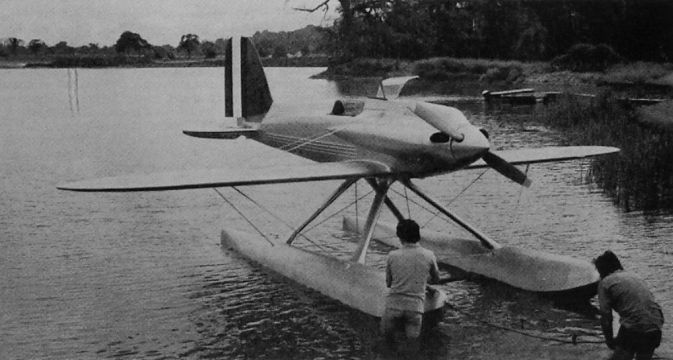 as practice machines for this year's Schneider Trophy Contest, and as one "S.5," piloted by Flight-Lieut. 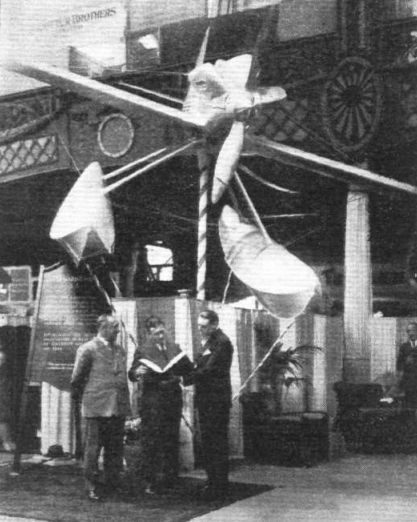 D'Arcy Greig, has established a British speed record of 319-57 m.p.h., no visitor to Olympia should fail to inspect the "S.5" on the Supermarine stand. 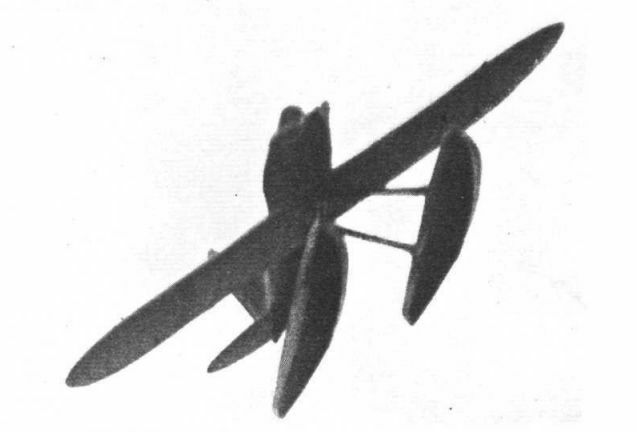 The "S.5" is a low-wing braced monoplane, with twin-float undercarriage. The fuselage is a duralumin monocoque, while the wings are of wood construction, covered with plywood 1/8-in. thick. Over the wing covering are placed the wing surface radiators. The duralumin floats are of the long, single-step type, and have a backbone in the form of one central longitudinal bulkhead of sheet duralumin, to which the transverse frames art attached. A special racing type of Napier engine is fitted in the nose and is entirely covered in. The water header tank is housed in the central cylinder block fairing, while the main petrol tank is situated in the starboard float of the undercarriage. An auxiliary gravity tank is housed in the fairing of the starboard cylinder block. The total petrol capacity is 55 gallons. With a wing span of but 26 ft. 9 in. and a wing area of 115 sq. ft., the "S.5," with direct-drive Napier, weight 3,100 lbs., and with the geared Napier, the weight is 3,250 lbs. The maximum speed of the machine with direct-drive engine is about 300 m.p.h., and with the geared engine about 320 m.p.h. The landing speed is approximately 90 m.p.h., so that it will be realised that the "S.5" is a very efficient aircraft, with a speed range of more than 3-5:1. It is worth recalling that in the Schneider Trophy Contest of 1927 at Venice, the winner, Flight-Lieut. Webster, on one of the "S.5" monoplanes averaged a speed over the 217 miles course of 281-65 m.p.h., while Flight-Lieut. Worsley, on the similar machine averaged 273 m.p.h. In the course of the contest also the winning machine established a new world record over a distance of 100 kms., with a speed of 283-68 m.p.h. HITHERTO it has not been possible to publish the data relating to the S.6B. 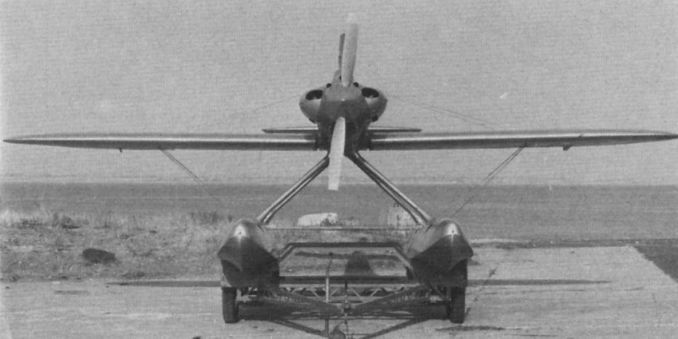 monoplanes designed and built by the Supermarine Aviation Works for the 1931 Schneider Contest. The general appearance of the machines has been shown in the innumerable photographs which have been published all the world over, but essential data, such as weight, etc., have been kept secret. It has now become permissible to give such data, so that, taken in conjunction with the article on the Rolls-Royce "R" engines on pp. 989-995, it is now possible, for the first time, to form a true picture of the achievement of all concerned in the production of the British 1931 Schneider defenders. It has already been recorded in FLIGHT that, when Lady Houston came forward with her magnificent offer of ?100,000 for the building of new machines and engines for this year's Contest, time was getting so short that neither the Supermarine Aviation Works nor Rolls-Royce, Ltd., had time to produce entirely new designs, but had to do the best possible in the time available with the 1929 machines and engines. Some of the difficulties encountered by the Rolls-Royce firm are set out in the article referred to above. In the following will be found a brief outline of the improvements made by the Supermarine Aviation Works, and which resulted in the production of the 1931 S.6B. monoplanes. Although the 1931 machines were generally similar to the 1929 type, it was found that detail improvement in the following items could be made: The oil system, the water system, the fuel system, the floats, and the aircraft controls. The Oil System. - In the S.6B. machines the oil system is, as before, housed entirely in the fuselage. When the oil leaves the engine, it is forced along the fuselage side coolers to the top of the fin tank. By an arrangement of ribs and gutters, the oil is kept in contact with the shell as it falls to the normal level and passes through a filter into the return (suction) cooler, which is built on the same lines as the side coolers, but is of greater section. Oil cooling had to be improved considerably in order to cope with the increased engine power, and it was found that the difficulty lay not so much in transferring the heat from the cooler to the air as in transferring it from the oil to the surface of the cooler. 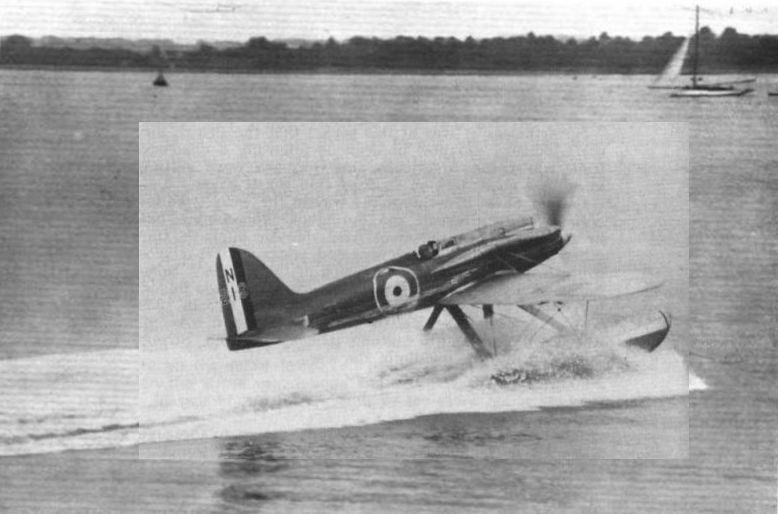 Eventually, as a result of extensive research work carried out by the Supermarine Aviation Works and by the R.A.E., it was found possible to increase the efficiency of the coolers by as much as 40 per cent. This was done by sweating small vanes into the oil ways, but a great deal of experiment was necessary before the type and pitch of vanes could be determined. Excessive restriction in the flow increased the pressure difference between inlet and outlet by an enormous amount. The gutters in the fin tank performed a similar duty, and the capacity of the tank itself was greatly increased to carry the additional oil required. In actual practice, the temperature drop between oil outlet and oil inlet reached 60 degrees C, a figure probably never before approached on any aircraft. The Water System. - In order to keep the new engines at the correct temperature, it was necessary to dissipate approximately 40,000 British Thermal Units of heat per minute from the cooling surfaces. The efficiency of the wing radiators could not be improved appreciably, and, therefore, more surface had to be provided somehow. The only extra surface available was that presented by the topsides of the floats. These were covered with radiators instead of the usual shell plating, and the addition of this extra cooling surface was very effective. A new type of header tank with a steam separator was designed to prevent any loss of water. In other respects the water system was unaltered. The Fuel System. - The fuel is carried inside the floats, and is delivered to a small pressure tank in the fuselage by engine-driven pumps. Normally the engine is fed from the pressure tank, but this is of small capacity and intended only to be adequate for the short period when the aircraft is doing a steeply-banked turn and when, due to centrifugal force increasing the weight of fuel, the pumps are unable to supply the engine. The starboard float carries much more fuel than the port, in order to offset the tremendous engine torque during take-off. The effect of full engine torque is to transfer a load of approximately 500 lb. from one float to the other. The New Floats. - Extensive tests have been carried out on model floats both in the Vickers Experimental Tank at St. Albans and in the Wind Channels of the N.P.L. in order to produce floats combining the best possible compromise between aerodynamic and hydrodynamic requirements. As a result of these researches it was found possible to reduce considerably the air resistance per unit of float volume, and at the same time the take-off characteristics were materially improved, both by a reduction in hump resistance and by better stability and less tendency to "porpoising." The fitting of water coolers on top of the floats presented considerable structural problems, as the radiators expand nearly half an inch when the water approaches boiling point. 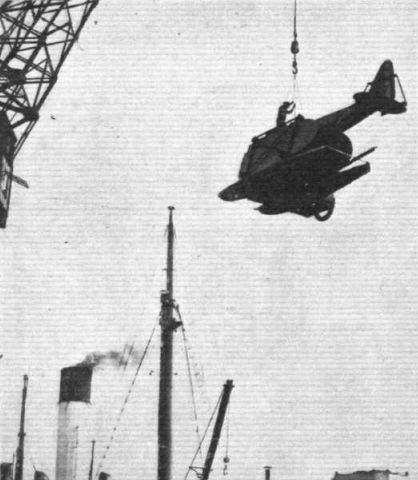 This expansion had to be allowed for in the construction of the floats, and to prevent buckling of the float planking an elastic framework construction had to be devised. The Aircraft Controls. - On the Supermarine S.5 machines of 1927 it was found that aileron flutter developed if the controls were permitted to become slack. Calculations showed that at the increased speed of the S.6B machine there was a possibility of trouble from this source, and mass balances were, therefore, fitted as a precautionary measure to ailerons, rudder and elevators. These mass-balances were found effective, and flutter was not experienced in the machines as finished for the Schneider Contest. 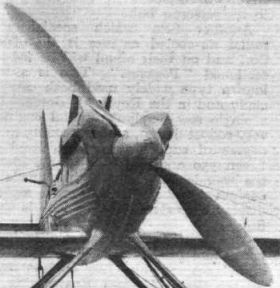 At the extremely high speeds attained by the S.6B machines the ordinary small inaccuracies in construction which are of no importance in slower machines, make themselves felt by producing air loads on fin and tailplane which must be countered by loads on the control column and rudder bar. As the tail unit is built into the fuselage no change in rigging was possible, and to overcome the difficulty very tiny fins or flaps were mounted on the trailing edges of rudder and elevators. 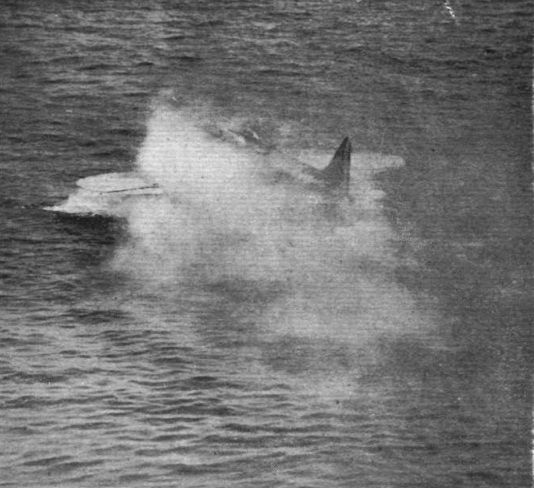 These small flaps could be bent to one side or other, and when a suitable position had been found, they relieved the pilot of the task of continually exerting a pressure on control column and rudder bar. These flaps are only a few square inches in area, but they proved extremely effective in use. A curious point arose in connection with airscrews this year. 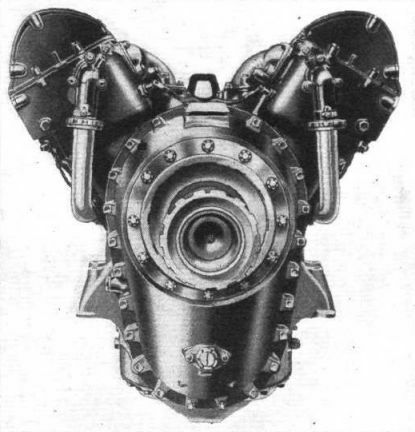 The new airscrews produced by the Fairey Aviation Co., Ltd., for the 1931 machines were of 8 ft. 6 in. diameter, as compared with 9 ft. 6 in. for the 1929 machines. It was found impossible to take off with these airscrews, owing to the fact that at an early stage in the take-off the machine swung violently to port, even with full starboard rudder. With the old 9 ft. 6 in. airscrews the take-off was easy, and in fact a great improvement on the S.6A's, owing to the improved float design. Eventually 9 ft. 1 1/2 in. 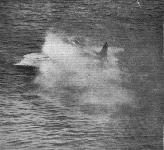 airscrews were found to give satisfactory takeoff, while with an 8 ft. 10 in. airscrew it was only just possible to get off under very favourable conditions. AN IMPRESSION OF SPEED: Flight-Lieut. 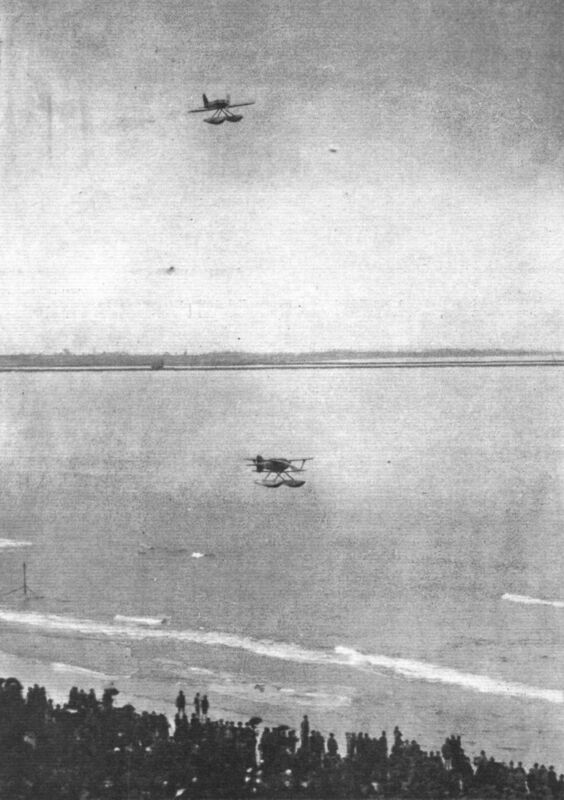 D'Arcy Greig (inset) and the outdated Supermarine S.5 N219, in which he creditably completed the course, flying low over Ryde Pier. Average speed for course 282-11 m.p.h. Photograph shows the author (John Hall) formating on Flight International’s Piper Seneca over gravel pits in Bedfordshire, where the S-5 was based for its Farnborough appearances this year (1976). VICTORY:- Flight-Lieut. 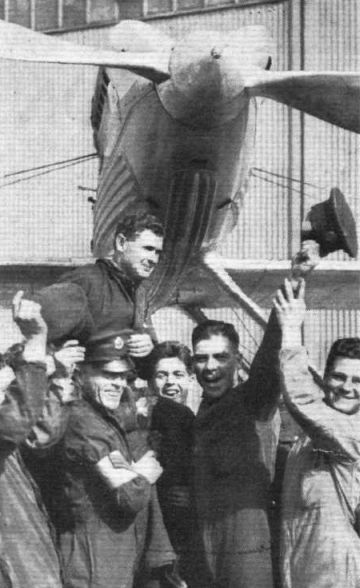 S. N. Webster, A.F.C., crossing the line, and thus winning back the Schneider Trophy for Great Britain. His average speed for the course was 281-54 m.p.h. GREAT BRITAIN GOING STRONG IN THE 1927 SCHNEIDER CONTEST :- Flight-Lieut Worsley on the Supermarine-Napier (direct drive) S.5 No. 6 being overtaken by Flight-Lieut. 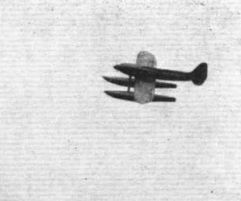 Kinkead on the Gloster-Napier No. IVb. A FINE BANK BY WEBSTER ON THE SUPERMARINE-NAPIER S.5 MONOPLANE. 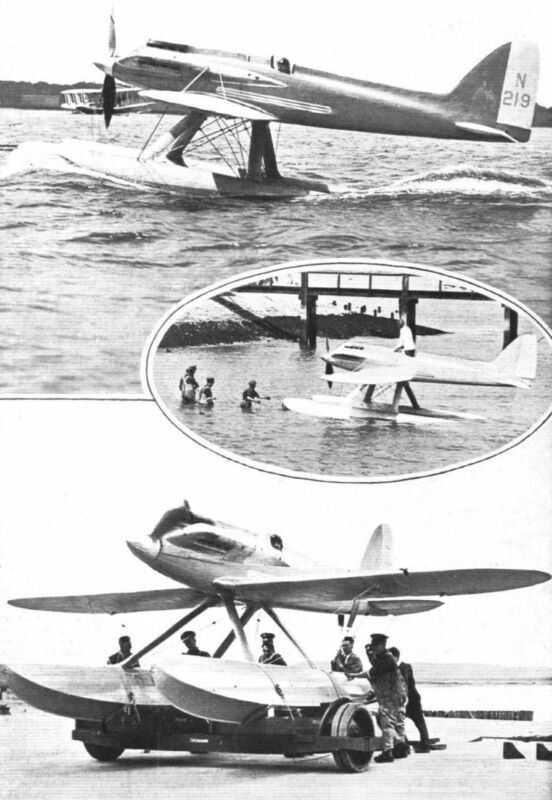 THE SCHNEIDER TROPHY RACE: Flight-Lieut. 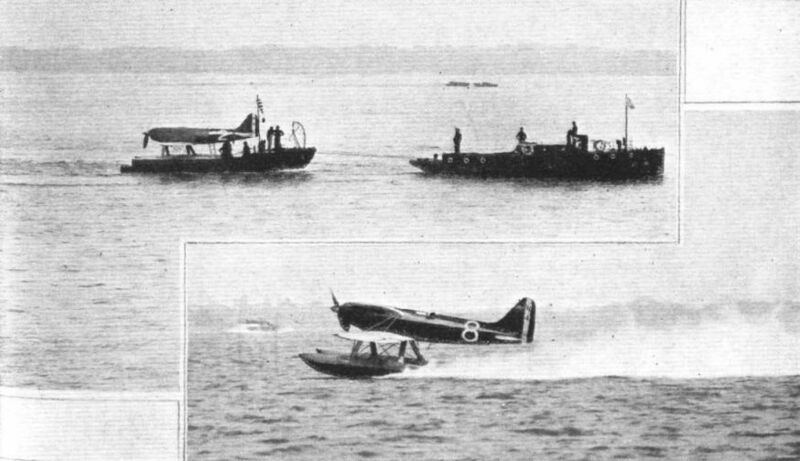 Webster flying straight, not quite so straight, and towing in the Supermarine S.5, on which ultimately he won the race. 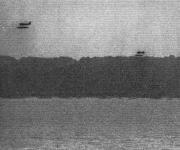 These photographs were taken during the navigability, etc., tests. 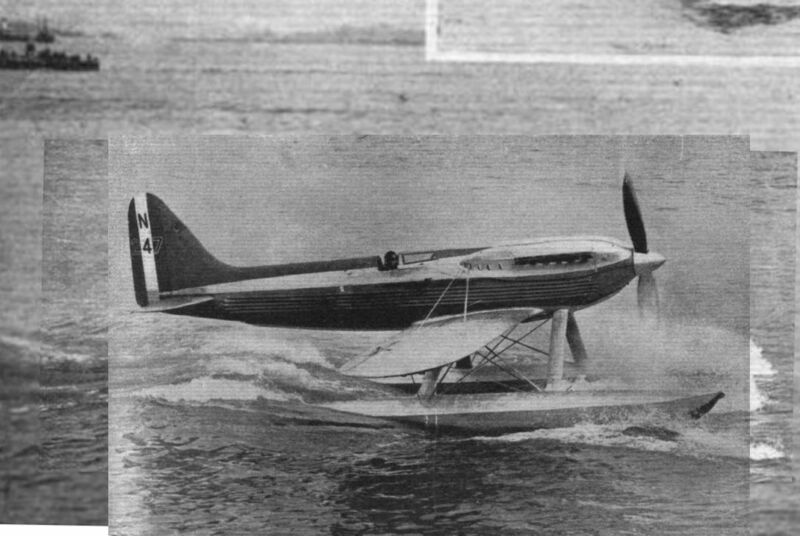 SUPERMARINE-NAPIER S.5: Racing Monoplane (Schneider Trophy Winner), with Napier Racing Engine. 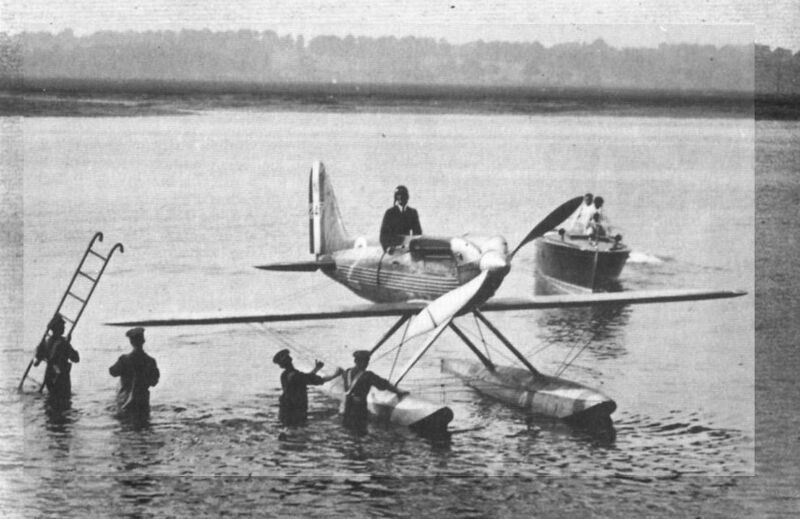 THE SCHNEIDER TROPHY RACE: Lieut. 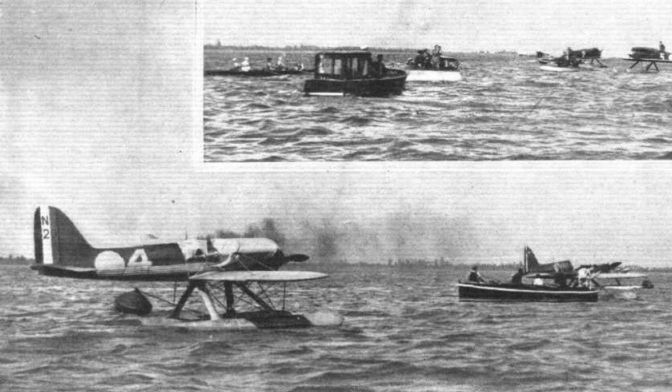 Worsley, in his Supermarine S.5, being towed out for the eliminating trials and, on the right, during the taxying test. PREPARING FOR "THE DAY": One of two of the British Schneider Trophy Challengers make trial flights at Venice. Sqdn.-Leader Slatter, on the Supermarine-Napier S-5, after the first practice flights on September 10. 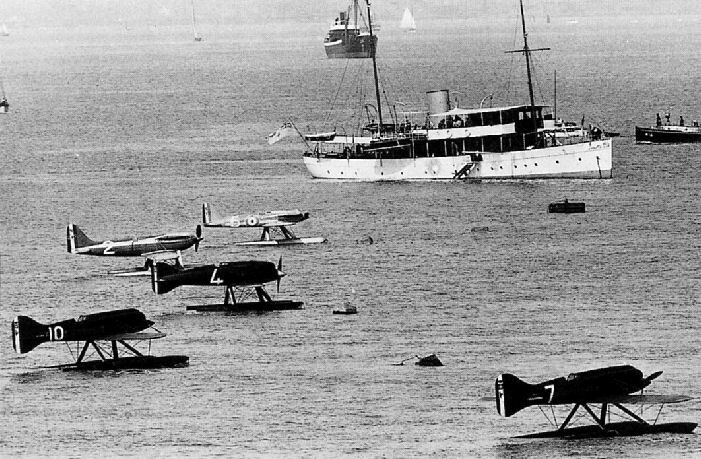 THE SCHNEIDER TROPHY RACE: View of the machines during the 6-hours' mooring test. The machine in the foreground is the Supermarine S.5 on which, later, Webster won the race. One of the 1927 S.5's. The S-5 on the slipway at Calshot in August 1975. SUPERMARINE "S.5" (Napier Racing Engine). 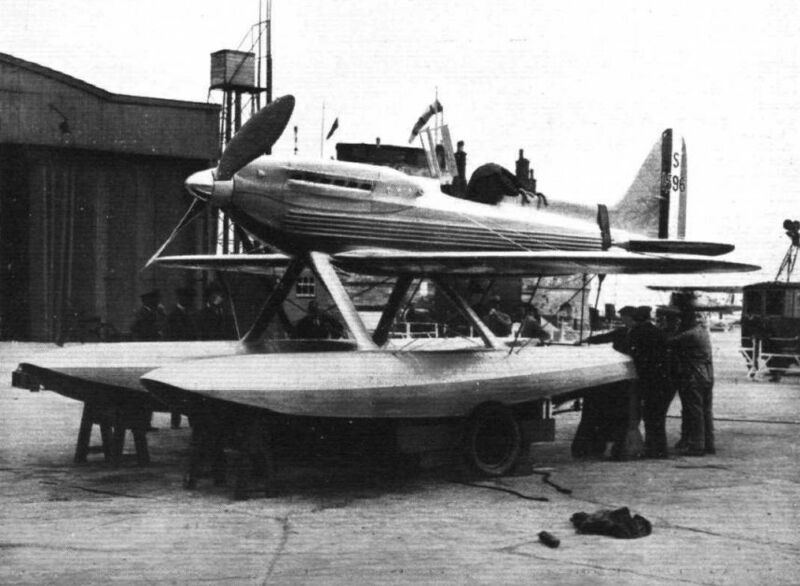 THE BRITISH CHALLENGER FOR THE SCHNEIDER TROPHY CONTEST: This front view of the Supermarine-Napier " S-5" give an excellent idea of its clean lines. THE SUPERMARINE S.5: This view give an excellent idea of the clean lines of the machine. Note particularly how neatly the Napier "Lion" racing engine is faired into the fuselage. This view of the unpainted S-5 replica shows the fine lines and small frontal area. The floats are not to scale; if they were the seaplane would sit too high on the water. THE BRITISH SCHNEIDER TEAM: This photograph, taken at St. Andrea, shows the two types of British machines in the race, the Gloster IV on the left and the Supermarine S.5 on the right. In front of the machines are seen, among others: First Row - L. E. Coombes, Capt. Forsythe (Air Ministry), Flying-Officer Schofield, Flight-Lieut. Kinkead, Wing-Commander Fletcher, Flight-Lieut. Worsley (second in the race), Air Vice-Marshal Scarlett (Commander of the R.A.F. team), Flight-Lieut. Webster (winner of the race), Sqdn.-Ldr. Slatter, Flying-Officer Moon (Technical Officer of the team), Maj. Buchanan (Air Ministry) Mr. Ransome, and Mr. Reason. Second Row Mr. E. Scott, Sir Harry Brittain (Director of Napiers), Mr. Vane (Managing Director of Napiers), Mr. Folland (designer of the Gloster IV), Mr. Mitchell (designer of Supermarine S.5), Commander Bird (Managing Director of the Supermarine firm) and Mr. R. E. G. Smith. 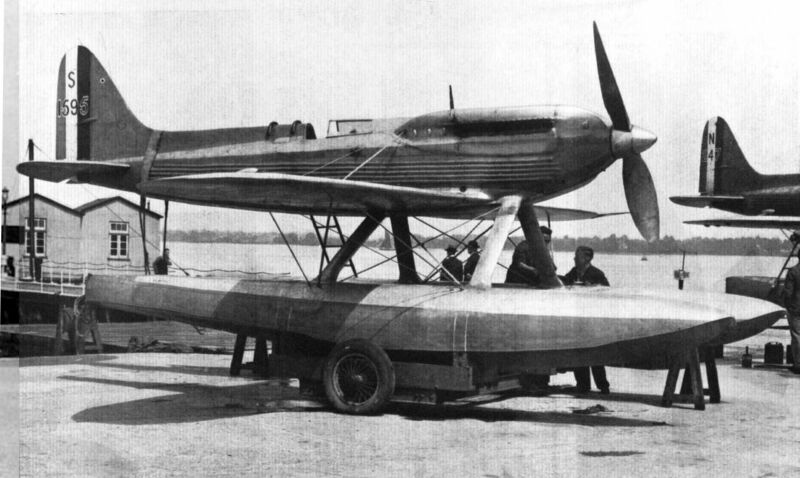 "AIR-MINDEDNESS": The Supermarine-Napier S.5 seaplane on which Flight-Lieut. 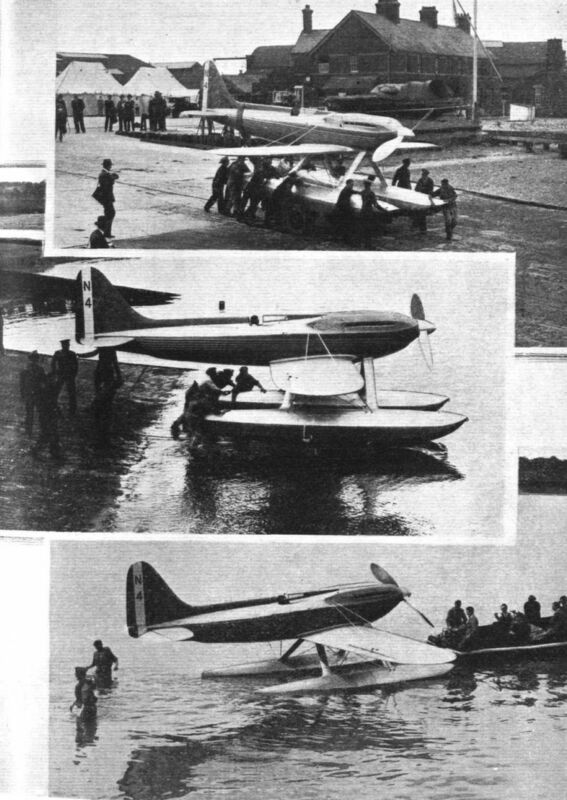 Webster won the Schneider Trophy Race on view at the Horse Guards' Parade. If the machine had not been two months en route from Venice, the interest in it would have been considerably greater. Inset, Mr. R. J. Mitchell and Mr. G. S. Wilkinson, designers of the machine and engine respectively. 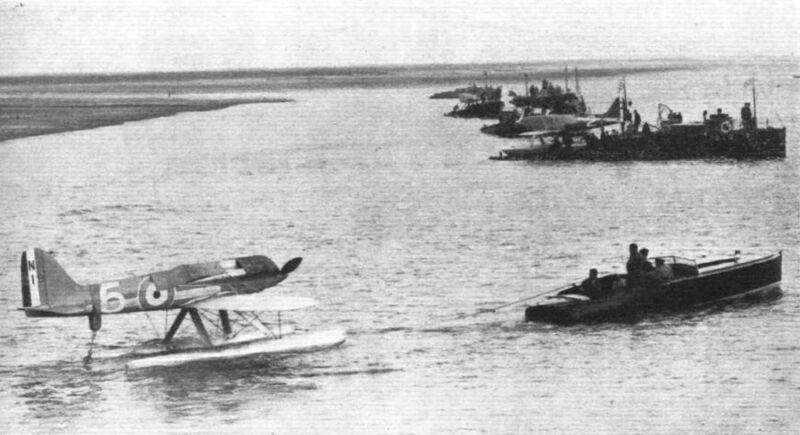 The Supermarine Machines: In the foreground the S.5 racing seaplane mounted in a very effective attitude. 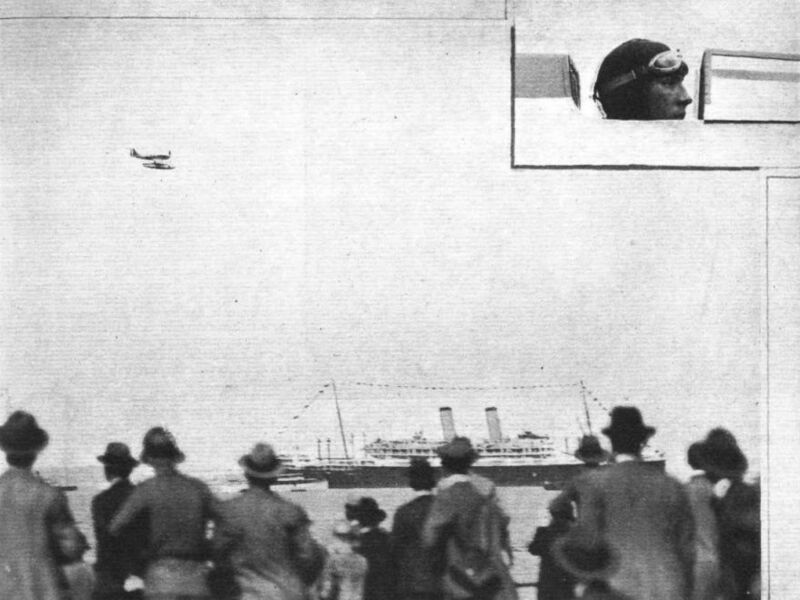 Behind it the "Southampton" flying-boat, which has made a flight of 27,000 miles. A SCHNEIDER TROPHY MEMENTO: During a visit to Olympia, Flt.-Lieut. S. N. Webster was presented with a Souvenir Album of the 1927 Schneider Trophy Contest - which he won. 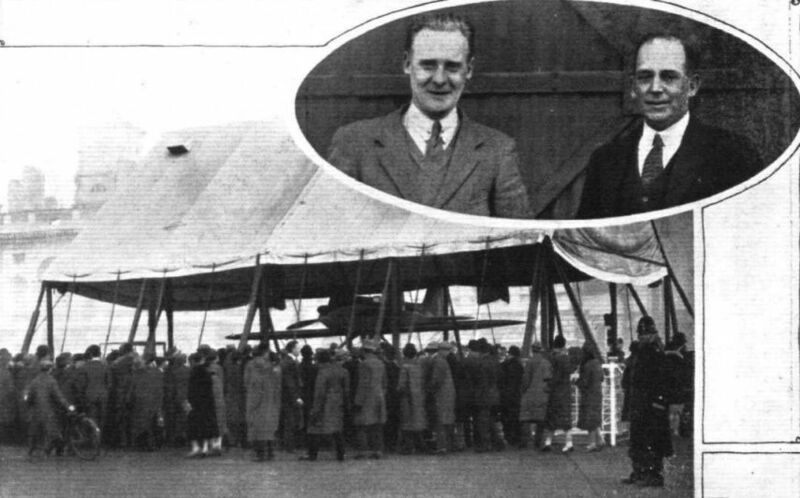 Our picture shows him, beneath the "S.5", with Mr. H. T. Vane of Napiers (left) and Comdr. 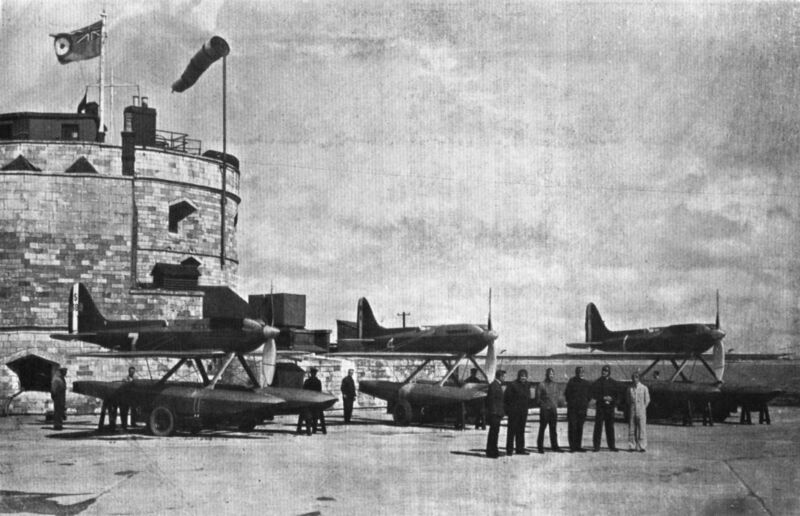 Bird of Supermarine Aviation Works, Ltd. (right). 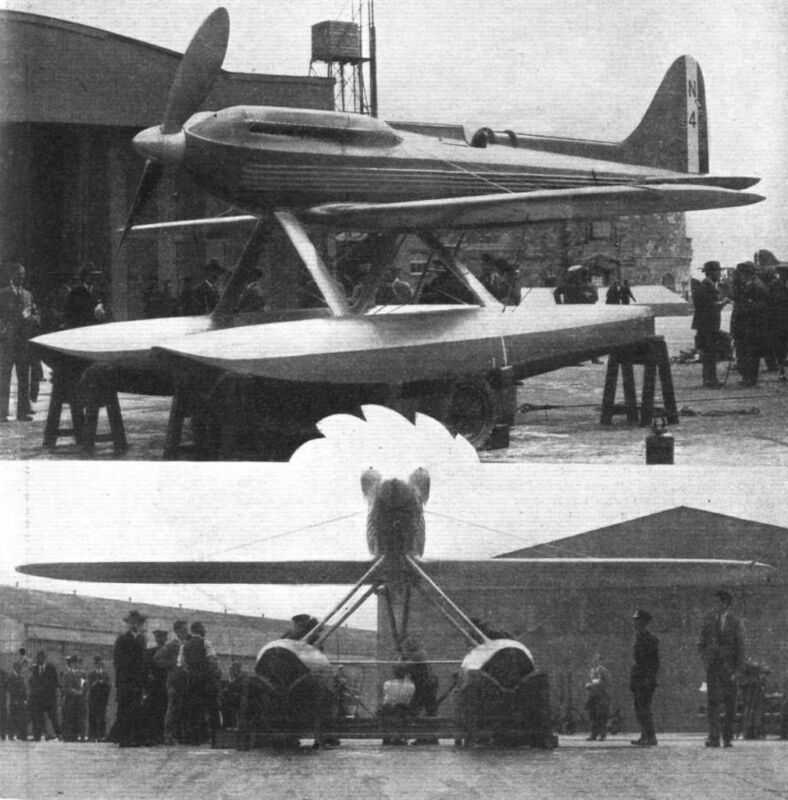 THE MONOPLANE CHALLENGER: Three views of the Supermarine-Napier "S-5," which is an improved development of the 1925 "S-4." 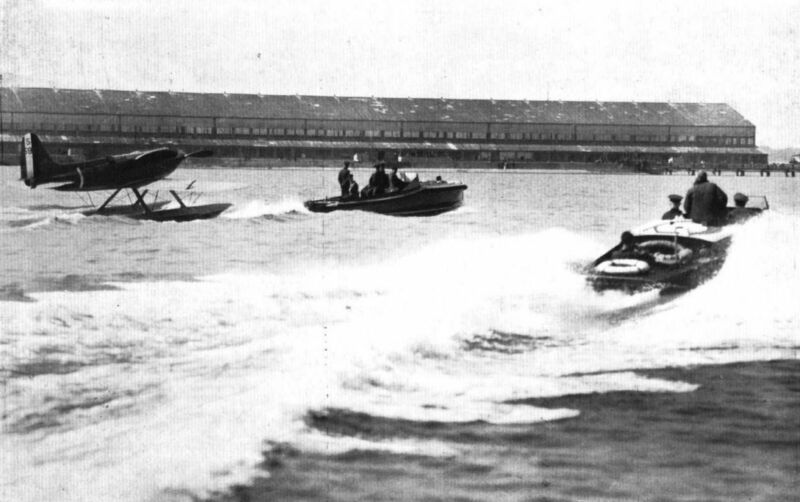 THE SPEED RECORD ATTEMPT: Testing the Napier engine of the Supermarine S.5 at Calshot. THE TENTH SCHNEIDER WINNER: THE SUPERMARINE-NAPIER S.5 (GEARED NAPIER "LION") ON WHICH FLIGHT-LIEUT. S. N. WEBSTER WON THE CONTEST FOR 1927. IT WAS AN IMPROVED DEVELOPMENT OF THE PREVIOUS YEAR'S S.4. THE OTHER TWO BRITISH CHALLENGERS: So as to enable our readers to form a comparison of all three machines we give herewith views of the Supermarine-Napier S-5 and the Gloster-Napier IV - both of which were described in last week's FLIGHT. 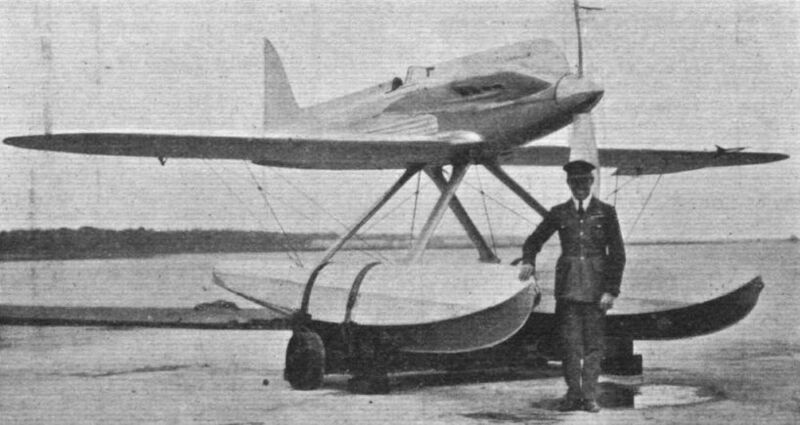 TO ATTEMPT THE WORLD'S SPEED RECORD: Flight-Lieutenant S. M. Kinkead, D.S.O., D.S.C., D.F.C., standing in front of a Supermarine S.5 seaplane. It is on a machine of this type, with Napier "Lion" racing engine, that the attempt to beat the Italian speed record of 297 m.p.h. will be made. TRAINING: One of the 1927 Supermarine-Napier S.5 machines, N.219, going off on a practice flight. 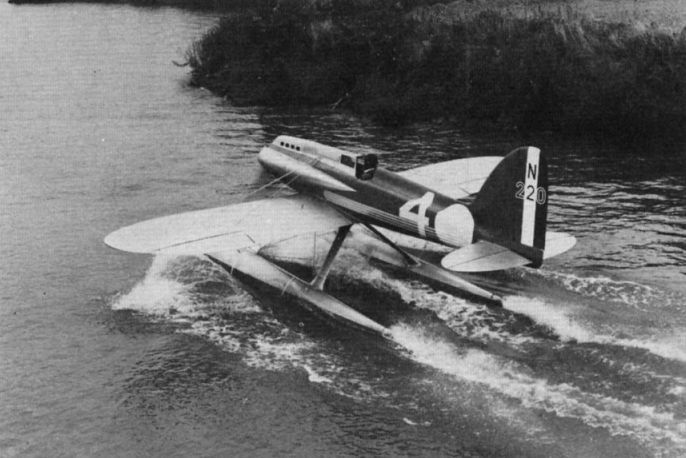 View of one of the original Supermarine S-5s, N220. 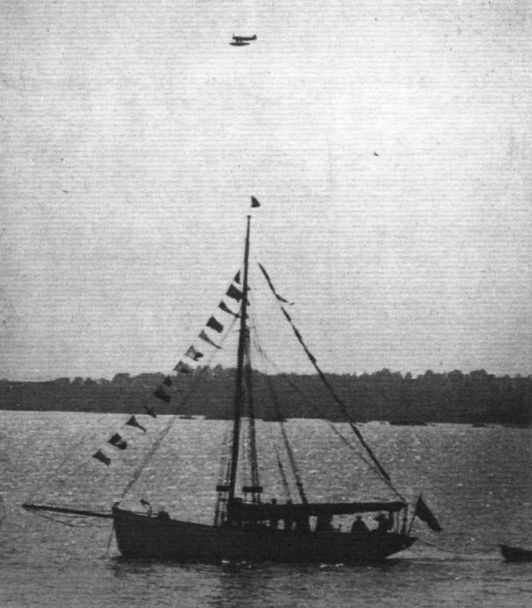 The photograph shows it at Venice in 1927, when Fit Lt N. Webster established a new World Speed Record over 100km of 283.6 m.p.h. in addition to winning that year’s Schneider Trophy Contest. 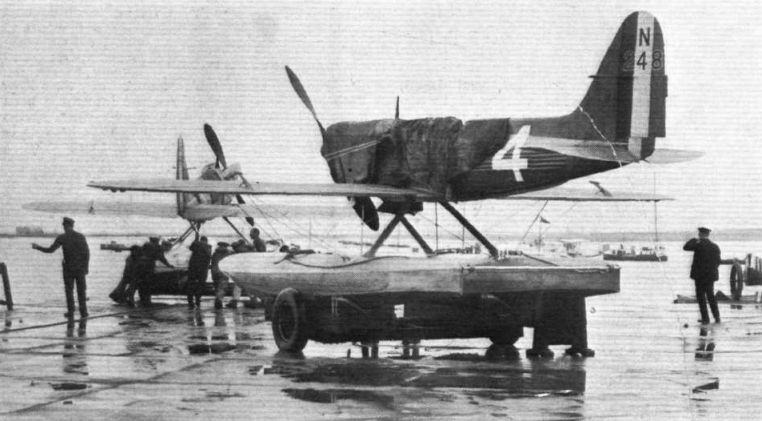 View of one of the original Supermarine S-5s, N220. Air Pictorial 1987-09 / J.Rawlings - Historic Aircraft: Should we fly them or keep them all safely in museums? The Supermarine S.5 replica in which its owner and pilot Bill Hosie died on May 23, 1987. READY FOR THE FRAY: The Supermarine machines going out to the navigability trials. The S.5 in the foreground and the two S.6's a little farther from the camera. 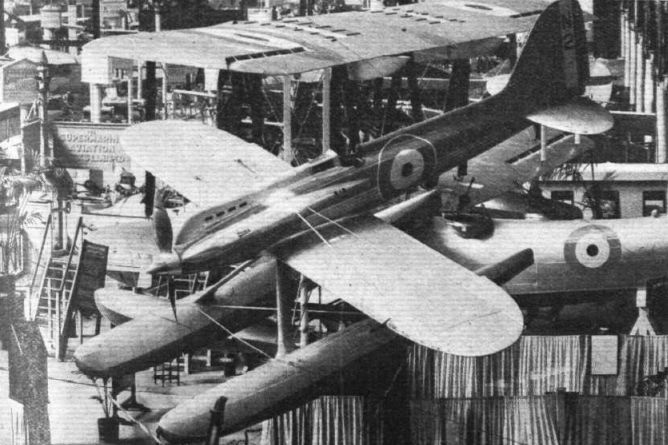 The two successful types: In the foreground, the Supermarine-Rolls-Royce S.6 of 1929, and behind, the Supermarine-Napier S.5. S.6A N247 выиграл Кубок Шнейдеров 1929 году, проводившийся в английском Райде. А 12 сентября 1931 года этот самолет установил новый абсолютный рекорд скорости - 575,6 км/ч. Fg Off H. R. D. Waghorn aged 25 was the surprise winner of the race and flew an extra lap by mistake, running out of fuel as he did so. Waghorn’s mount was the Supermarine S.6 N247. MORE THAN SIX MILES A MINUTE: Sqdn.-Ldr. 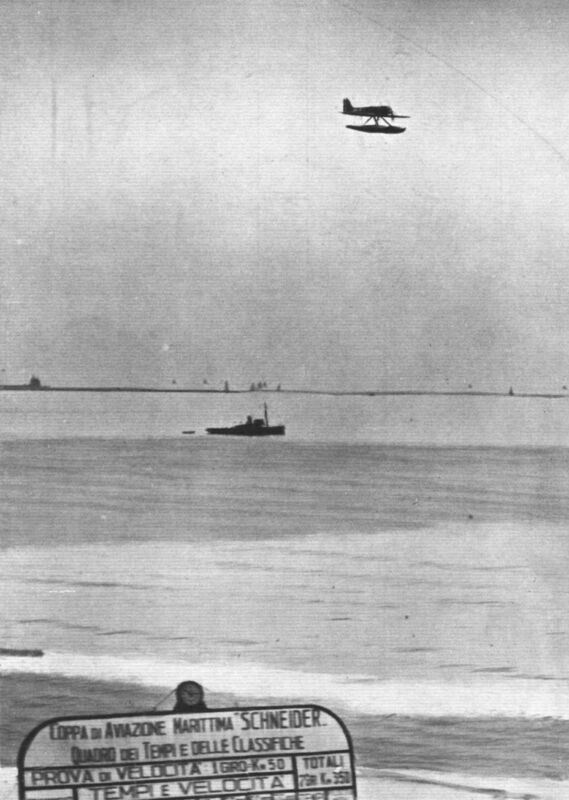 Orlebar coming ashore after establishing a new World's speed Record in the Supermarine S.6. During the flight he must repeatedly have exceeded a speed of six miles a minute, and very probably at times he was doing nearly 400 m.p.h.! 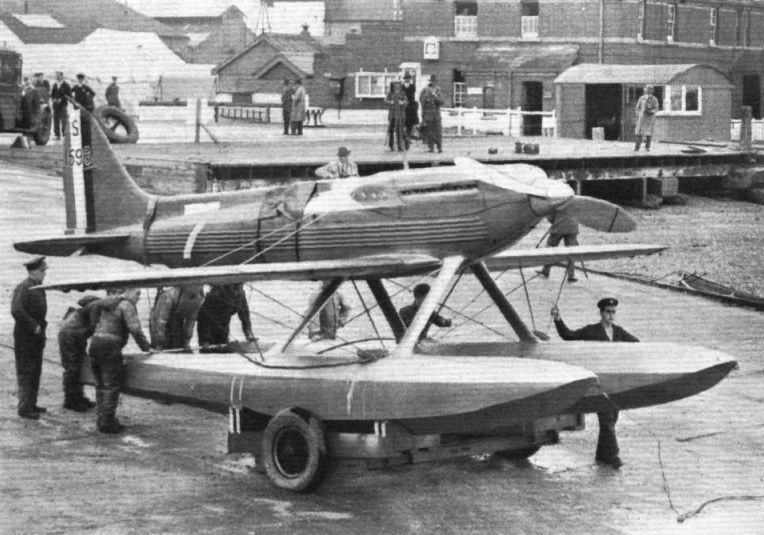 A WEIRD CRAFT: The Supermarine-Rolls-Royce S.6 on board one of the special pontoons used for transport purposes. READY TOR LAUNCHING: S.1596 on one of the special pontoons used for transporting the machines from Calshot to the point of take-off. 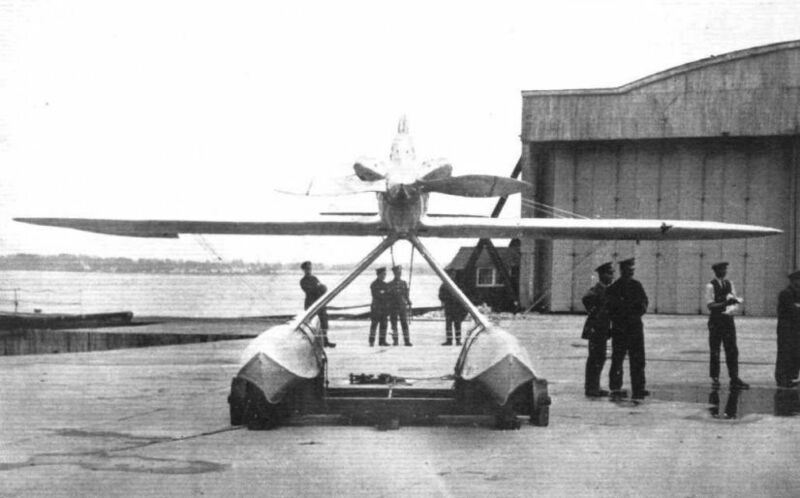 GOING AFTER THAT RECORD: The Supermarine Rolls-Royce S.6B, S.1596, being lowered down the slipway at Calshot for Stainforth's successful attempt to beat the speed record. 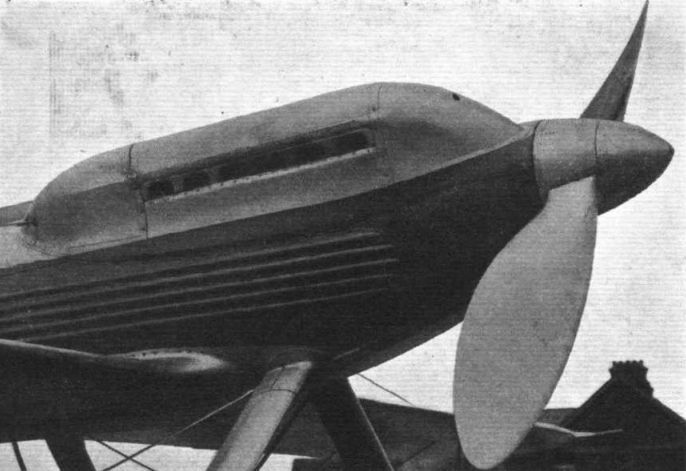 Успех S.6B на гонках Шнейдера. 13 сентября 1931г. : С целью в третий раз выиграть для Британии Кубок Шнейдера в гонках принял участие на S.6B флайт-лейтенант Дж. Н. Бутман. Он пролетел маршрут длиной 350 км со средней скоростью 547,305 км/ч. S.6B, улучшенный S.6, был оснащен мотором Rolls-Royce "R" мощностью 2300 л.с. Бутман в 7,5 раз превысил среднюю скорость победителя первых гонок на Кубок Шнейдера, состоявшихся 18 годами ранее. A VICKERS-SUPERMARINE ROLLS-ROYCE S.6.B. : This seaplane, S1595, is the first of the two new racers to be delivered to the High-Speed Flight at Calshot. other, S1596, was delivered on August 11. 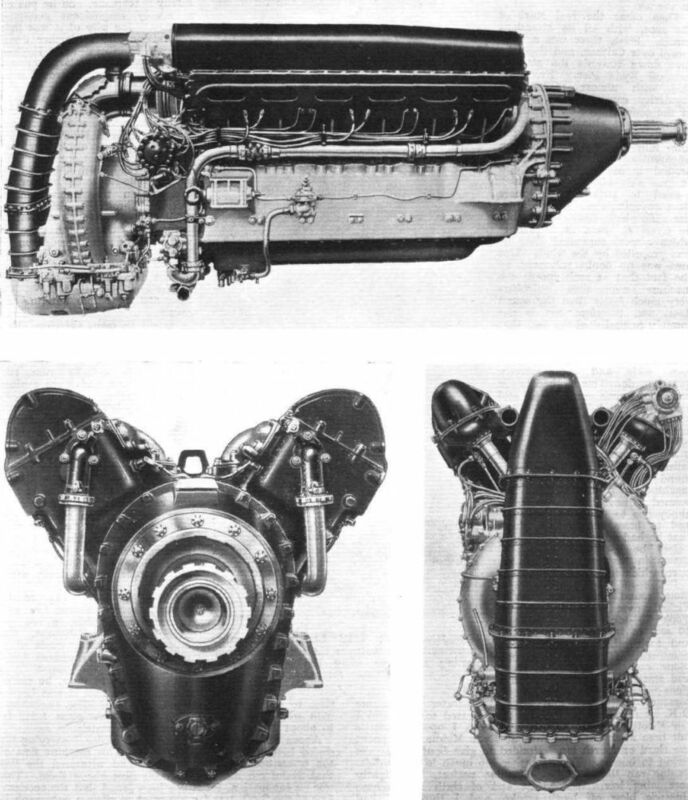 The Rolls-Royce "R" engine is housed in the Vickers-Supermarine S.6 B with a minimum loss of space, and in an extremely small frontal area. It was on this actual machine, but with a different Fairey metal airscrew, that Flt.-Lt. Stainforth established a new world's speed record of 408-8 m.p.h. The Supermarine S.6B S1596, intended for permanent display in the Mitchell Memorial Museum, during one of its rare appearances. At this time (1967) the spinner was incorrectly painted black, but has since been corrected. 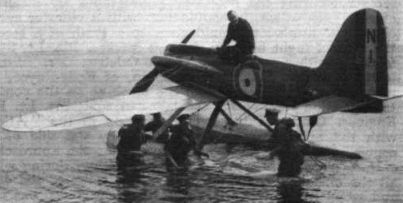 Supermarine S.6B (13 September 1931). ONE OF THE BRITISH 1929 DEFENDERS: The Supermarine S.6 is an all-metal low-wing monoplane, fitted with Rolls-Royce "R" type engine. Создатель S.6B Реджинальд Митчелл позже спроектировал истребитель Spitfire. Тем временем, разработавшая двигатель "R" группа во главе с сэром Генри Ройсом создала для него мотор Merlin. The second Vickers Supermarine Rolls Royce S.6.B. - Marked S1596. Гидросамолет S.6B N 51596 - собрат самолета, выигравшего в 1931 году Кубок Шнейдера. На этой машине лейтенант Джордж Стейнфорт 29 сентября 1931 года установил абсолютный мировой рекорд скорости - 655,87 км/ч. The second Vickers Supermarine Rolls-Royce S.6. 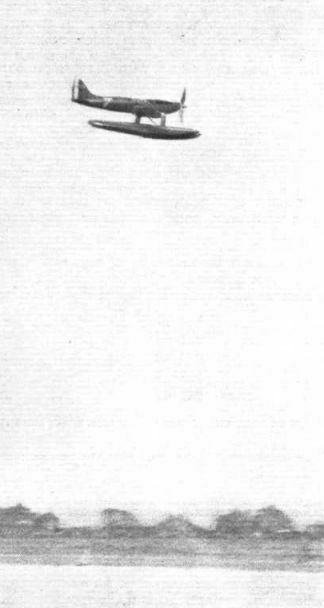 "B" - Marked S1596. SCHNEIDER WINNER AND WORLD'S SPEED RECORD HOLDER: ONE OF THE SUPERMARINE ROLLS-ROYCE S.6B MONOPLANES BUILT FOR THIS YEAR'S CONTEST. THE MACHINE SHOWN IS S.1596 ON WHICH STAINFORTH ESTABLISHED A NEW SPEED RECORD. BOOTHMAN S MACHINE IS IDENTICAL. Supermarine S.6B. On the roof garden at London (Heathrow) Airport. Note short floats. The two British Schneider types. Nearest is the Gloster-Napier VI, and behind that the Supermarine Rolls-Royce S.6, which won the contest and established a world's speed record of 357 m. p. h.
One of the 1931 S.6 B machines. Next to it one of the 1929 S.6's. THE THREE MACHINES WHICH MAY BE FLYING IN THE 1931 SCHNEIDER CONTEST: From left to right - S.1596, N.248 and S.1595. The central machine is the 1929 type modified, while the two other are the new machines built this year. Standing in front of the machines are the members of the Schneider Team. Two Supermarine S.6Bs flank the S.6. FUELLING: This view of one of the new Supermarine Rolls-Royce S.6 B machines gives a very good idea of the clean lines and small frontal area. Large quantities of petrol are carried in the floats, more in one than in the other, in order to counteract the propeller torque. PITCH: A Fairey metal airscrew from the Schneider Trophy Supermarine S.6 will be shown at Copenhagen. CHANGING A PROP: As in previous years, the Fairey Aviation Company has supplied all the metal airscrews for the Schneider machines. PREPARING FOR FLIGHT: Starting the Rolls-Royce engine of the new Supermarine S.6 by means of a Bristol gas starter. READY FOR ANYTHING: The three British Schneider machines on Sunday morning, September 13. Farthest away is Boothman's S 6B, S 1595. 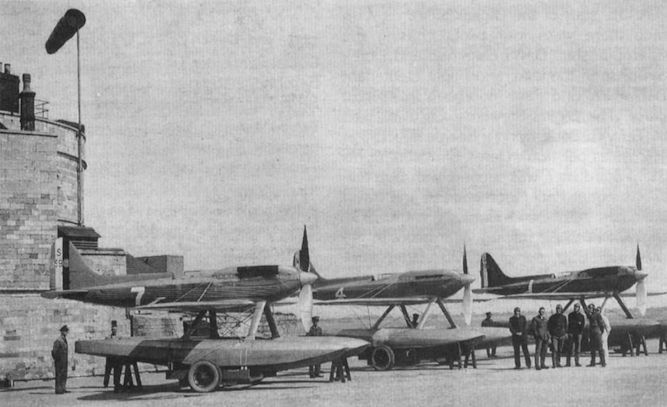 In the centre, the S 6A, N 248, and in the foreground the S 6B, S 1596, on which Flight-Lieutenant G. H. Stainforth established a new world's speed record of 610-01 km. h. (379-05 m.p.h.) over the 3 km. course in Southampton Water. "POSTPONED ON ACCOUNT OF WEATHER": Scene at Calshot on Saturday last. The Schneider machines are wearing their raincoats. 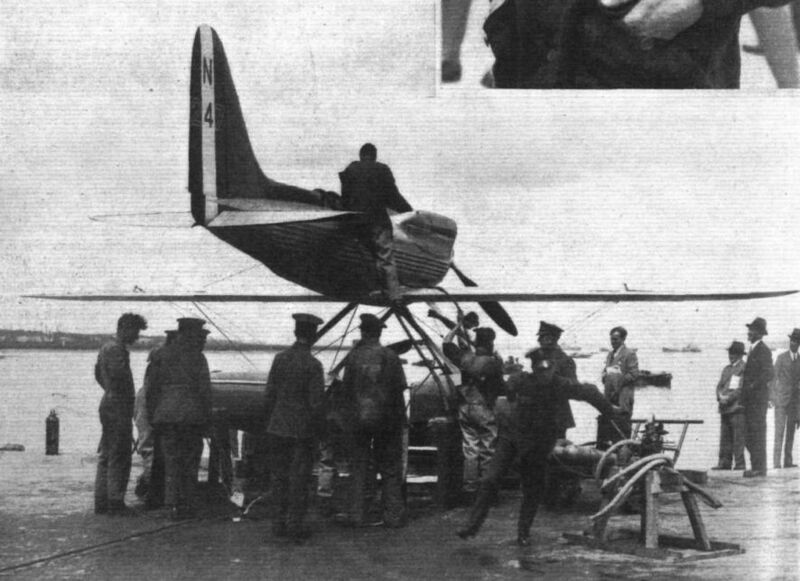 LAUNCHING THE SUPERMARINE ROLLS-ROYCE S.6: Above, Wheeling the machine down the slipway. In the centre, Taking the water. And below, The machine afloat, ready to be towed out. Sqdn. Ldr. A. H. Orlebar, A.F.C. O.C. of the High Speed Flight, in the cockpit of the Supermarine Rolls-Royce "S.6." 6 сентября 1929г. : участники гонок на Кубок Шнейдера изображены накануне гонок в Колшоте во время испытаний на мореходность и швартовку. Гонки выиграл флайт-офицер X. Р. Д. Уогхорн на гидросамолете Supermarine S.6 (номер 2 на снимке), вторым стал унтер-офицер Молин на гидросамолете Macchi M.52R (номер 4). "SITTERS": The six machines at their buoys during the 6 hours' watertightness test. 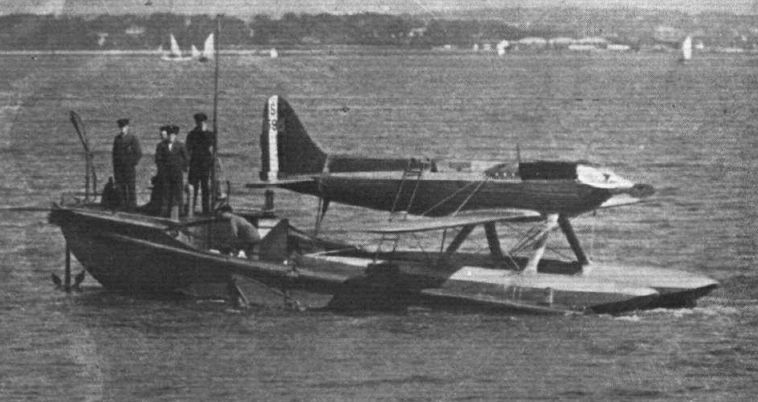 GOING OUT: Boothman's Supermarine Rolls-Royce S.6B being towed to the starting point on one of the special pontoons. Fg Off R. L. P. Atcherley in the S.6 N248. Keeping cool in the hot weather: Squadron-Leader Orlebar, Captain of the British Schneider Team, going out for a test flight in one of the Supermarine-Rolls Royce S.6's. 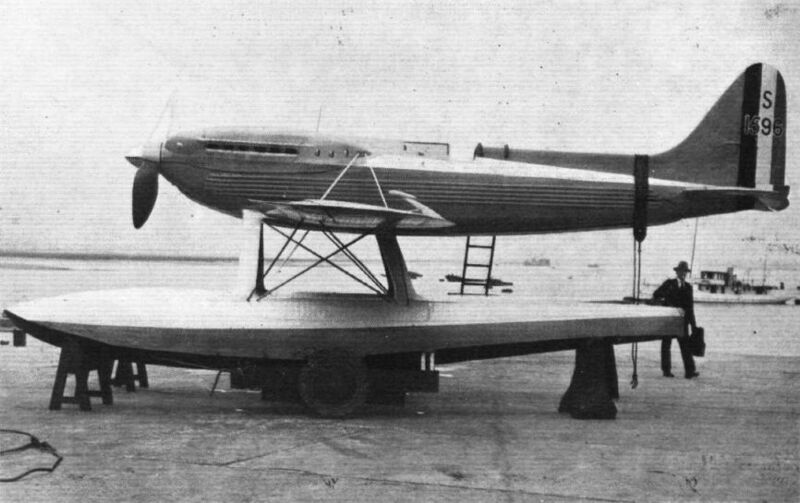 THE FIRST VICKERS SUPERMARINE ROLLS ROYCE S.6.B. - MARKED S1595: Flight-Lieut. Long in the cockpit. August 1931. GETTING OVER THE "HUMP": Fit. Lt. Stainforth taking off in S.1596. AFLOAT AND A-WING AT CALSHOT. 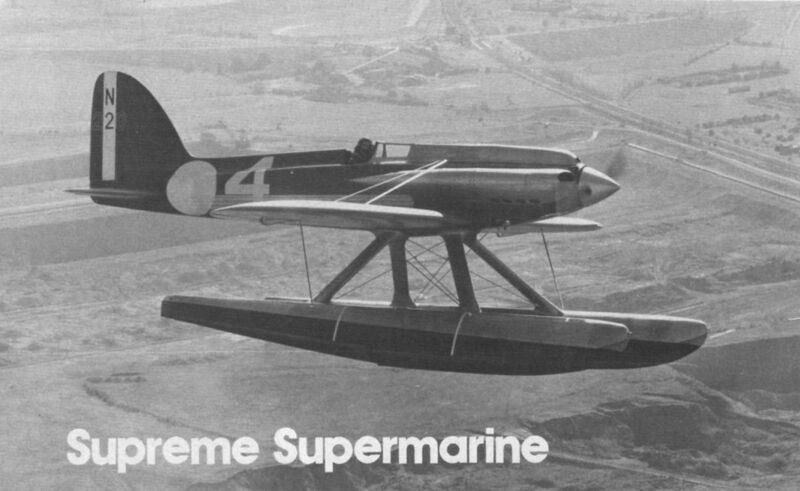 THE SUPERMARINE S.6. AT 400 M.P.H. : Stainforth approaching the 3 km. course during his flight on September 13, when he raised the straight-line record to 610.01 km./h. (379.05 m.p.h.). When the special engine has been installed in the machine another attempt will be made. HEADING FOR THE LINE: Stainforth's Supermarine Rolls-Royce S.6B snapped while getting ready to enter the speed course. ALONG THE HAMPSHIRE COAST: Flying Officer Waghorn heading for the West Cowes turning point. 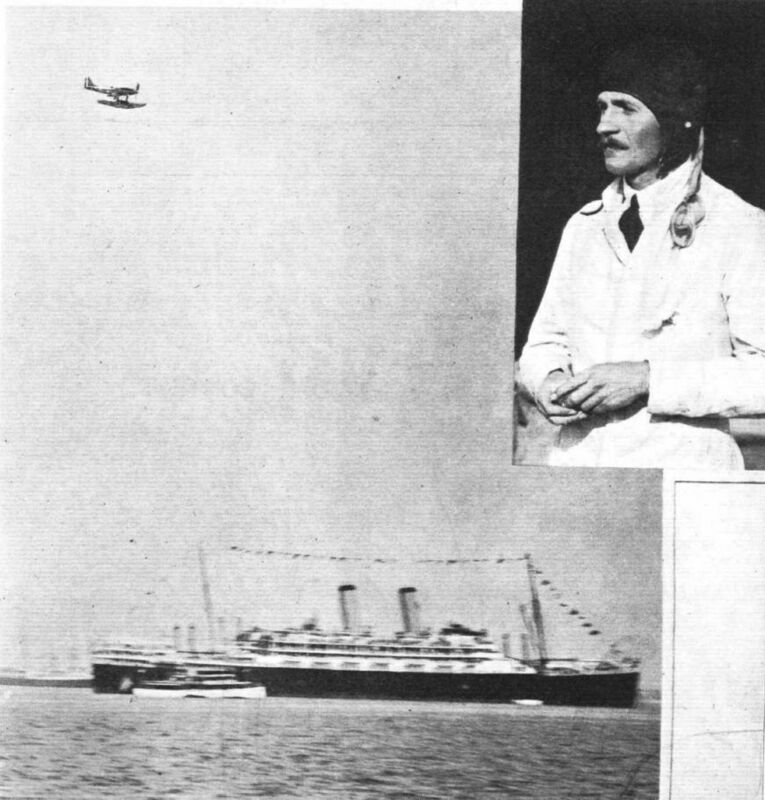 THE WINNER OF THE 1929 SCHNEIDER TROPHY CONTEST: Flying Officer H.R.D.Waghorn (inset) crosses the finishing line over the Orient liner "Oxford," after having covered the 350 km. course at an average speed of 328-63 m.p.h. 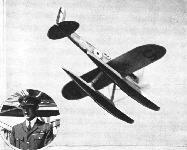 He was flying an all-metal Supermarine S.6 monoplane, fitted with Rolls-Royce "R" type racing engine. 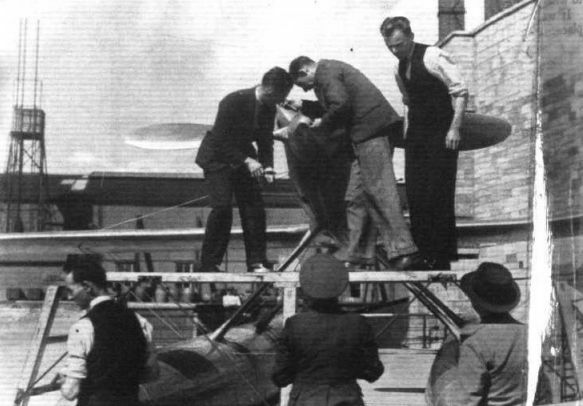 THE FINISH OF A WORLD'S RECORD: Flying Officer Atcherley crossing the line at the end of his seventh lap, during which he established a world's record for speed over a closed circuit. His sixth and seventh laps constituted a world's record for 100 km. closed circuit. 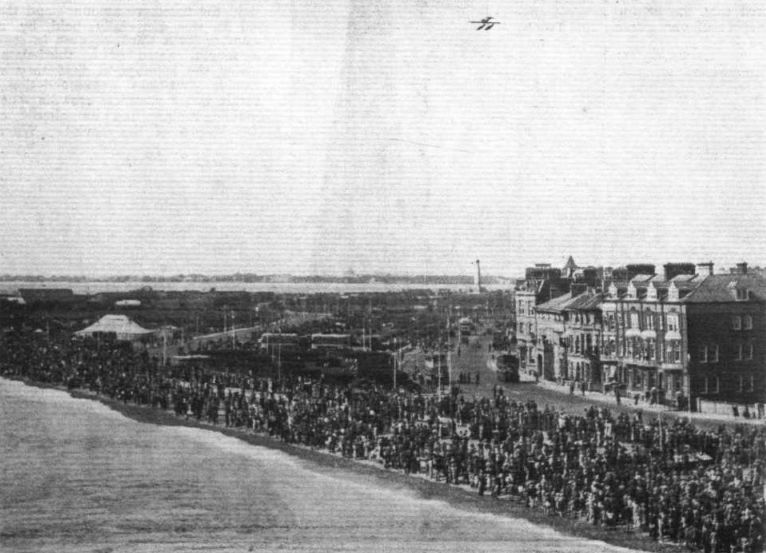 BOOTHMAN PASSING OVER THE SHORE AT SOUTHSEA: The beach was lined with spectators. THE LAST SCHNEIDER EVENT: Bringing Boothman's, S 6B in after the completion of the 217 miles' course at an average speed ot 340-08 m.p.h. A GOOD JOB WELL DONE: Fit. 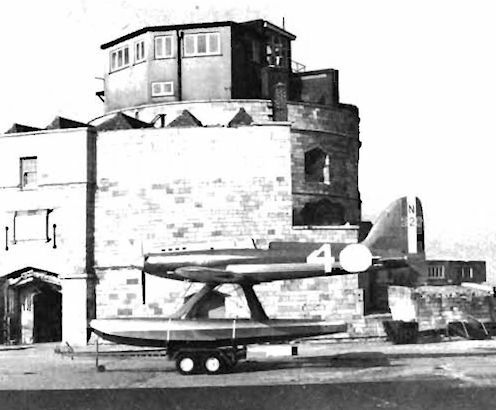 Lt. G. H. Stainforth returns to Calshot after establishing the new world's speed record. The photograph shows rather well the somewhat unusual shape of the Fairey metal airscrew. The pitch, it will be noticed, is quite perceptible. CHAIRING THE WINNER: Fit. Lt. Boothman receives enthusiastic support on his return to Calshot after completing the Schneider course. 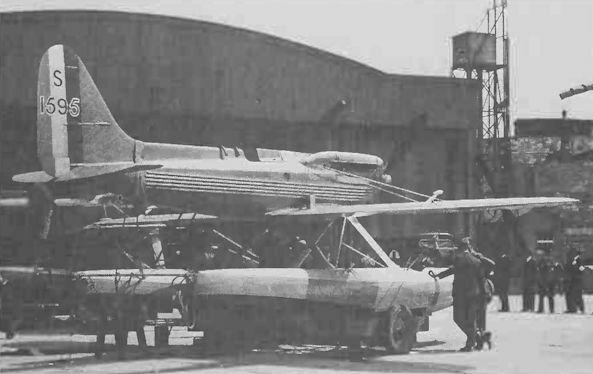 SCHNEIDER TROPHY WINNER IN THE AIR AGAIN: The Supermarine-Rolls-Royce "S.6" seaplane, which won the Schneider Trophy last year, being shipped at Southampton en route for the Antwerp Exhibition, where, by permission of the Air Ministry, it will form one of the most important exhibits of the British Section. ENSHRINED: The Vickers Supermarine S.6B and the Wright biplane are two of the great attractions at the Science Museum. The Business End of the Supermarine S.6: Of the Rolls-Royce "R" type engine nothing is seen but the exhaust ports. The most powerful Aero Engine in the World: The Rolls-Royce Type "R" Engine fitted in the Supermarine S.6, which won the Schneider Trophy Contest, and which has since established a World's Speed Record of 357-7 m.p.h. Note the extremely small frontal area. A BRITISH TRIUMPH OF ENGINEERING: The Rolls-Royce "R" type racing engine fitted in the Schneider machines has been developed from the "H" type, but gives well over 2,000 h.p. for a weight of rather less than three-quarters of a pound per horsepower. The engine is geared and supercharged. In the upper photograph the supercharger can be seen on the left, while the two lower photographs show the engine from the front and from the rear. THE SUPERMARINE S.5: Three views of the all-metal fuselage. The lower photograph shows it in skeleton. 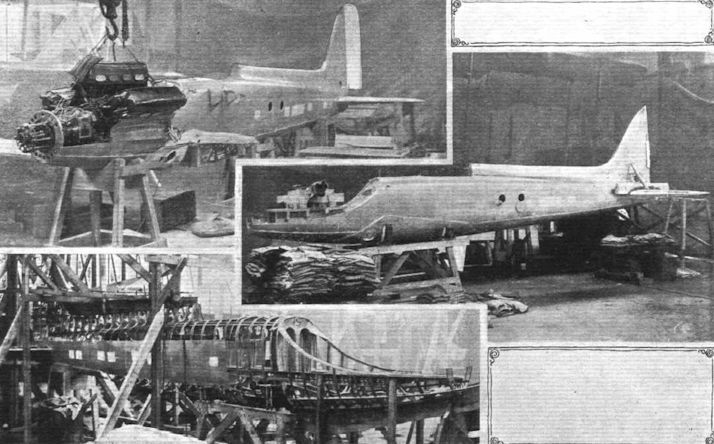 In the centre the fuselage is seen undergoing sand loading test, and in the upper picture the Napier "Lion" racing engine has been dropped into place. Note the supports for the cylinder block fairing. 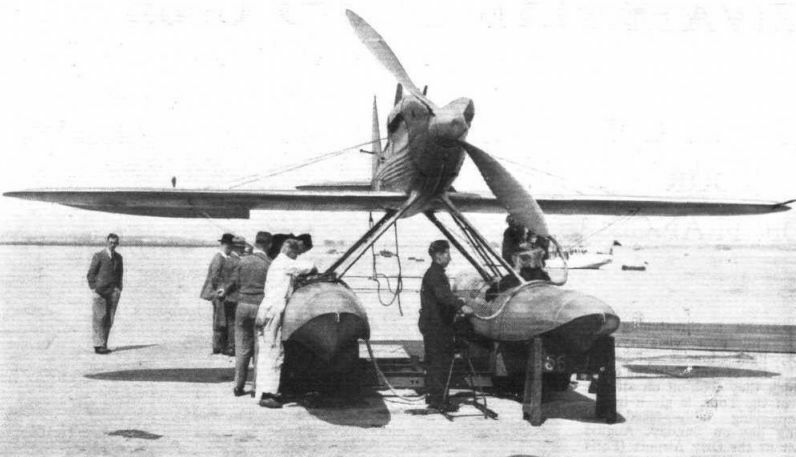 THE SUPERMARINE S.5: On the left, a three-quarter rear view of the fuselage, showing wind screen and cylinder block fairings. On the right, a view inside the engine cradle. 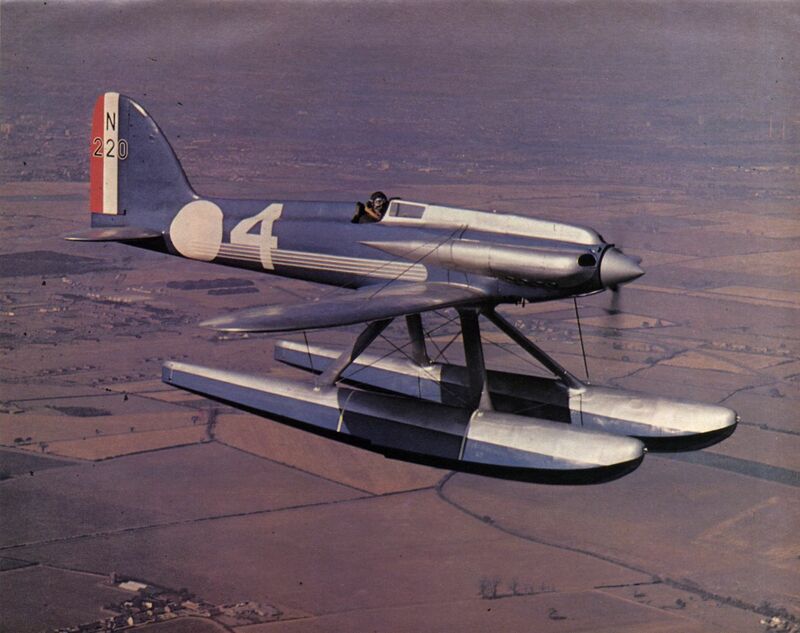 THE SUPERMARINE S.5: The steel centre portion of the starboard float, which forms the petrol tank. Standing on end is the water header tank, and on the right the oil tank. The small inset shows a section of the central bulkhead of the steel portion of the float. 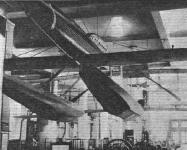 Photograph of one wing of the S.5. 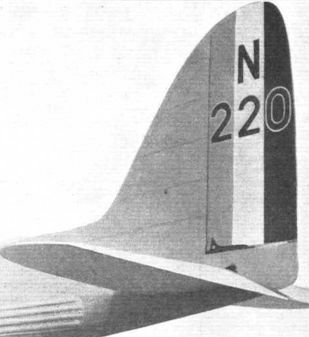 Note the diagonal member which stiffens the wing tip against torsion. 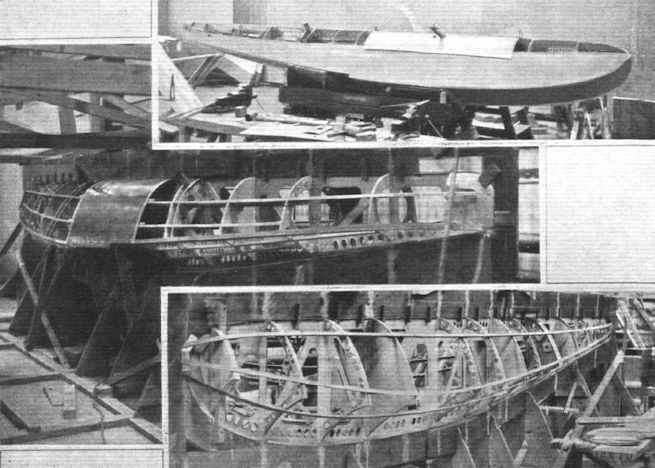 THE SUPERMARINE S.5: Three views of a float, in skeleton, with the petrol tank installed, and finished, except for the deck planking. THE SUPERMARINE S.5: The tail of the Schneider Trophy Winner. The control cranks are inside the stern portion of the fuselage.